When Julia Child wrote Mastering the Art of French Cooking, she meant it to be a fail-safe, proven guide to help the average American cook create elegant and delicious French food. It took her years to write and was a landmark publication when it finally hit shelves in 1961. So when Julie Powell, an average American cook, came upon this cookbook at her mother’s home in Texas, she came up with the brilliant idea to work her way through this 750-page bohemith one recipe at a time. She blogged about her successes and failures, her worries and concerns. She was the reader Julia Child was hoping for when MtAoFC was written. The Julie/Julia Project, as the blog came to be called, was one of the best ideas yet hatched in the new age of blogging. One year later, Powell had mastered all 500+ recipes, gained massive fame, and had a book deal in the works. 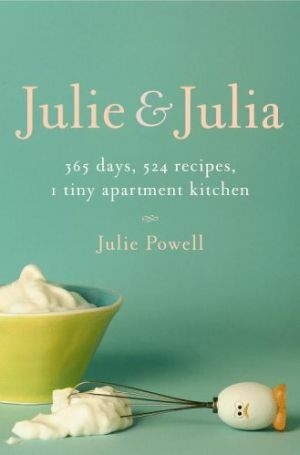 Two years later, Julie Powell’s first book Julie & Julia: 365 Days, 524 Recipes, 1 Tiny Apartment Kitchen was published. I really wanted to like Julie & Julia. This book had all the ingredients for a great publication, but the result was far from well done. Powell’s numerous rants about work, family, and failed cooking experiments overshadowed the real purpose of this book: to talk about The Project. Julie & Julia comes across as a whiney long blog entry, unorganized and unprofessional. Her language is vulgar, her blog is maybe mentioned three times, and her ego is so distracting that I can’t help but despise her. She is constantly harping on her husband, the one person standing by her side throughout the span of her project, and, I hate to be a prude, but she calls Julia Child a b**ch one too many times for me. Not cool, lady. If you’re interested in learning about Powell’s year of French cooking, don’t even bother with this book. Instead browse her blog or watch the recent movie of the same name. Although I am a huge fan of the movie, I will say that both renditions have the same fault: too much Julie and not enough Julia. NEXT WEEK: It is a truth universally acknowledged that a zombie in possession of brains must be in want of more brains.